Did I mention we have air conditioning now? I guess I didn’t need to; I’m sure everyone heard our sighs of relief from many miles away. Our new air conditioner is not lowering the temperature to arctic levels, thank goodness. It simply makes our house livable — and it makes it possible to cook again. The local restaurants will notice our absence, but I sure did miss my kitchen. When I mentioned that I wanted to venture into unknown territory, culinarily speaking, Tom tamped down his initial reservations and suggested lettuce wraps. We’d tried making them before with ground turkey. They were … okay. Kinda bland, we thought. Then we had the Asian chicken wraps at Father Fat’s Public House, and learned just what great lettuce wraps should be. Our goal was not so much to recreate Father Fat’s version as to learn from it and create our own. Tom suggested cooking the chicken in slices, then shredding it. I was afraid the chicken would be dry, but it wasn’t at all, and there was an added advantage: the thin slices meant the marinade flavored every bit of the chicken. Tom also said to add a bit of cooked brown rice. We do this when we make potstickers. The rice helps to bind the filling together. I added chopped water chestnuts for crunch, and sliced green beans for color (and because I had some in the crisper). Grated ginger may or may not have snuck in when I wasn’t looking. (Tom hates ginger, especially when he actually witnesses it going into a dish.) Sriracha heated things up; lime juice contributed an acidic topnote. The green beans are negotiable. They were both tasty and crunchy, but you could use minced bell pepper or shredded carrot instead with equal success. We were hoping for the tender cup-shaped leaves of butter (Boston) lettuce, but leaf lettuce was our only choice. I’d go with butter lettuce when the opportunity arises for ease of use, but the leaf lettuce was just fine. 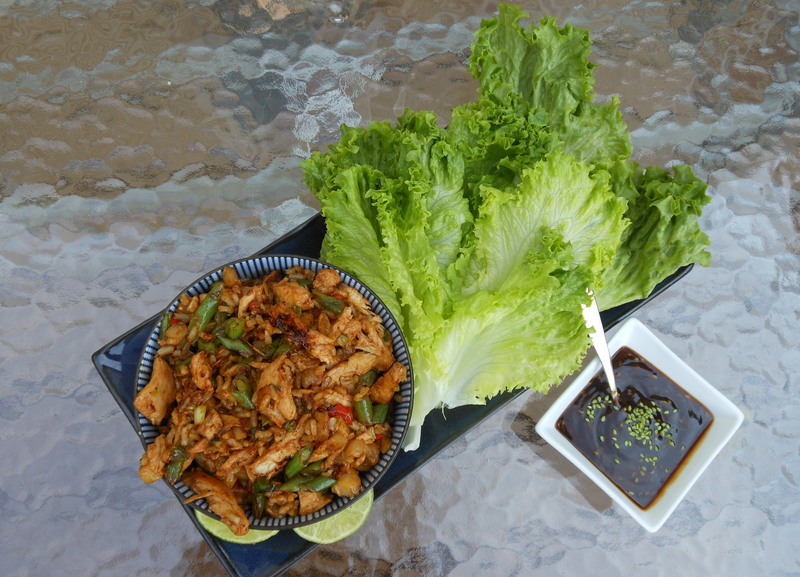 The cool lettuce is a perfect foil for the spicy, fragrant chicken. A sprinkle of peanuts adds the final touch. Tom says we should try the chicken over rice, or stuffed into spring roll wraps. Luke would like it over soba noodles. In any case, we’ll be making these again soon. In a small bowl or 1-cup measuring cup, whisk together marinade ingredients. Slice the chicken breasts thinly across the grain. Put the sliced chicken in a ziplock bag and pour in the marinade. Seal the bag, pressing out the air, and massage gently to distribute the marinade. Refrigerate for at least 1 hour and up to 8 hours. In a large skillet over medium-high heat, sauté scallions and garlic in 1 tbs. of the oil for a minute. Add the water chestnuts, chile, and green beans along with 1/2 cup water. Cook, stirring now and then, until the water is evaporated and the green beans are crisp-tender. (If you’re using peppers or carrots instead of green beans, skip the water.) Cook for 3-5 minutes longer, until the veggies are lightly browned. Scrape into a bowl and add the cooked brown rice. Return the pan to the heat (no need to wash it) and add the remaining tbs. oil. Add the chicken in one layer (in batches if necessary) and cook for about 3 minutes per side until cooked through and lightly browned. Discard remaining marinade. While chicken cooks, whisk together the sauce ingredients in a small bowl. Roughly shred the cooked chicken into the veggie/rice mixture. Add about a tablespoon of the sauce and a squeeze of lime juice. Serve alongside the lettuce leaves with the peanuts and extra sauce. To eat, scoop some of the warm chicken mixture into a lettuce leaf, add a few peanuts, a dollop of sauce (if you wish), and a squeeze of lime. Wrap and eat. This entry was posted in appetizers, main courses, meat, poultry,and fish and tagged Asian, chicken, healthy, lettuce, lettuce wraps, low-fat, peanuts, spicy, teriyaki, water chestnuts. Bookmark the permalink.